Elevation Tumblers are double-walled stainless steel with copper lining, to keep hots hot and colds cold longer. FORT COLLINS, Colo., Oct. 16, 2018 /PRNewswire/ -- Outside is not a club, there is no members-only door, no secret handshake. Outside is for everyone and no matter how you get outside, you should have fun doing it. OtterBox is the perfect wingman for your outdoor adventure with an expanded line of modular Elevation tumblers, available in time to get an early start on holiday shopping. Elevation Tumblers are double-walled stainless steel with copper lining, to keep hots hot and colds cold longer. 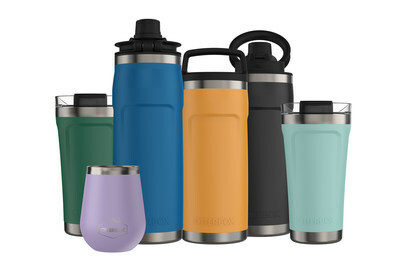 Elevation is the one drinkware to replace all others, with lid options that transform the tumbler from morning coffee to sealed water bottle to soup vessel and more. A full slate of new sizes adds to the line's versatility. "Our goal is to enable your adventures, no matter what adventures you like doing – from fourteener hikes to backyard barbeques, ice fishing to sledding," said OtterBox CEO Jim Parke. "With Elevation Tumblers, you can keep your beverages at the temperature you like and drink it the way you like it." Wine Tumbler, 10 oz., $19.99: Available in five attractive color options, the wine tumbler is the perfect size with a wide base for stability and lidless to let wine breathe right out of the bottle. Elevation 16, 16 oz., $24.99: Keep coffee hot on the go with this convenient size, which comes with a closed lid and works with most lids in the modular system. Elevation 28, 28 oz., $34.99: This bottle-sized drinkware comes with a lid, so you can pack your drink along for the journey. Elevation 36, 36 oz, $44.99: Stay hydrated for a long trek in this growler-sized bottle, available in one of four attractive colors. The new sizes join the lineup of Elevation 10 and Elevation 20, also available in a wide variety of color options. Elevation 20 is compatible with the new Flavor Infuser Lid and French Press Lid. All products are covered by OtterBox Limited Lifetime Warranty. For more information on OtterBox outdoor products, visit otterbox.com.